An Atlanta-based professional theater company that has provided Broadway musicals for more than 60 years and performed at the Fox Theatre since the 1980s is taking its final bow. On Thursday, Theater of the Stars announced its closing for good. The theater company first said it was struggling in June and tried to raise $1 million dollars by the end of August. Those efforts were unsuccessful and the company canceled its entire season at the Fox Theatre. The company says its currently working to liquidate and wind down the organization. Brian Frey is Vice President for Theater of the Stars. Frey says the main problem was the company relied too heavily on ticket sales and not on community support before reorganizing this past spring. Frey says the closure will affect musicians, technicians, arts patrons and actors. Maria Somma is with Actors’ Equity Association, a national union that’s been supplying talent for Theater of the Stars productions for 50 years. She says the closure means a loss of about 100 roles per year. Bill Newberry was in charge of auditioning and working with children and teens for Theater of the Stars productions. He says there will be fewer family friendly theater productions and it will have a major effect on Atlanta children and teens. “We’ve had kids that I have put in shows for Theater of the Stars who that’s been their big break and they’ve gone on to be on Broadway and on TV, American Idol. It’s going to make harder for kids to find that vehicle to raise the bar as far as their performance abilities. WABE was unable to reach FOX Theatre President and CEO Allan Vella. In the past, Vella has said the recent cancelation of the company’s season would be painful in the short-term but would not affect the FOX in the long-term because the FOX is on sound financial footing. 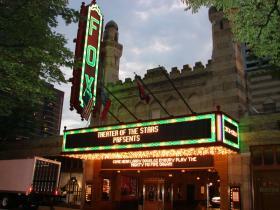 Those who have purchased single tickets for Theater of the Stars productions can seek refunds through the FOX Theatre. Theater of the Stars says it hopes to make decisions about what will happen to its subscribers within four to five weeks.